We’d love your help. Let us know what’s wrong with this preview of Hello! 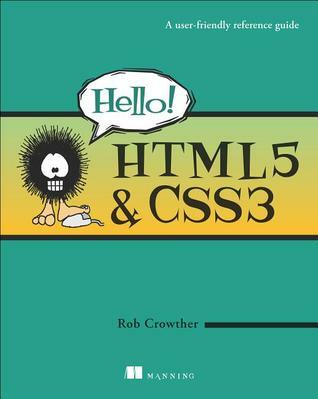 HTML5 and CSS3 by Rob Crowther. HTML and CSS are the foundation of the web, and HTML5 and CSS3 are the latest standards. Anyone who builds web pages, mobile apps, or does any type of development at all, must master these languages. Hello! HTML5 and CSS3 is written for the web designer or developer who wants a fast, example-oriented introduction to the new HTML and CSS features. After a quick review of the basics, the book moves quickly into building real pages in HTML5. Learn how to seamlessly integrate audio and video with HTML5, then add some style with new CSS3 features such as drop shadows, borders, colors, gradients and backgrounds. Discover how to target specific devices with media queries, and do all of it with less code. Finally, walk through several large examples that demonstrate how HTML5 and CSS3 working together can produce responsive and lightweight applications. To ask other readers questions about Hello! HTML5 and CSS3, please sign up. It was an excellent read. But I wrote it, so I'm biased. Good overview of new features in HTML5 and CSS3.